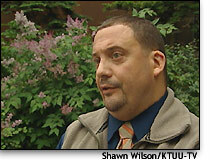 Anchorage, Alaska - The Alaska Supreme Court made a major ruling Friday. Doctors can no longer make psychiatric patients take medicine against their will unless the doctor proves it’s the only alternative. The case was filed on behalf of Faith Myers. 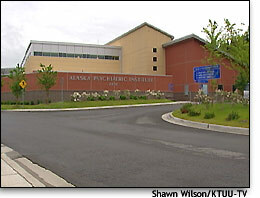 Myers says doctors at the Alaska Psychiatric Institute gave her forced injections of a drug she says wasn’t working, all the while asking them to stop. Myers says when a local doctor changed her prescription for stress disorder, she started hearing voices but doctors wouldn’t give her any alternatives. So Myers stopped taking the medication. “I went without medicine for, I would say, close to two years,” said Myers (right). In 2003, after the death of her father, Myers began acting out her fantasies. “I would take field trips with my little rodentia up there, in my bag, and they were my children,” said Myers. 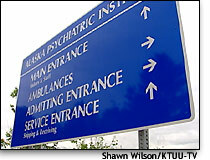 Myers was taken to Alaska Psychiatric Institute against her will for a three-month stay. 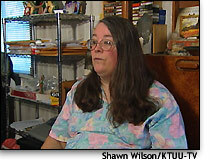 Myers says doctors forced her to take more drugs and took away her dignity. “They take you into a padded room, they pull down your pants and they inject you,” said Myers. 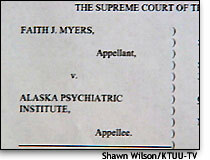 So Myers sued, and today the Alaska Supreme Court rules in her favor. Myers' attorney Jim Gottstein says the ruling is a validation of personal rights. “It’s really a part of a system change effort to create more choices for people in the community,” said Gottstein. “They have to show that there is a compelling state interest, in this case the safety of the individual involved. And there’s no less intrusive means available to provide treatment,” said Mark Morones, spokesperson, Alaska Department of Law (left). 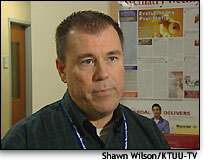 API doctors say they don’t prescribe medicine without believing it will work. “A psychiatrist is only going to prescribe medication if they feel that it’s not only in the patient’s best interest, but if they feel that it is going to shorten the length of hospitalization for the patient,” said Durbin Hobbs, MD, API psychiatrist. "I chose the medication I’m taking. I chose it because it works,” said Myers. A medicine Myers says she has faith in. It is important to note that API doctors asked the court for permission before forcing medicine on Myers. But Friday, the state Supreme Court found the doctors did not meet the standard of proof that what they were doing was the best course of action and that no alternatives were available. The ramifications of the ruling are just now beginning to be discussed, but according to the Department of Law, Friday’s judgment will not affect anyone who the court has already ordered to take medicine. The ruling is specific to psychiatric drugs.